(Nanowerk News) Magnetic nanoparticles can increase the performance of solar cells made from polymers - provided the mix is right. This is the result of an X-ray study at DESY's synchrotron radiation source PETRA III. Adding about one per cent of such nanoparticles by weight makes the solar cells more efficient, according to the findings of a team of scientists headed by Prof. Peter Müller-Buschbaum from the Technical University of Munich. They are presenting their study in one of the upcoming issues of the journal Advanced Energy Materials ("Improved Power Conversion Efficiency of P3HT:PCBM Organic Solar Cells by Strong Spin–Orbit Coupling-Induced Delayed Fluorescence"). Müller-Buschbaum's team has been pursuing a different approach, however. "The light creates pairs of charge carriers in the solar cell, consisting of a negatively charged electron and a positively charged hole, which is a site where an electron is missing," explains the main author of the current study, Daniel Moseguí González from Müller-Buschbaum's group. "The art of making an organic solar cell is to separate this electron-hole pair before they can recombine. If they did, the charge produced would be lost. We were looking for ways of extending the life of the electron-hole pair, which would allow us to separate more of them and direct them to opposite electrodes." The researchers set out to find a material that was able to convert the spin 0 state into a spin 1 state. This required nanoparticles of heavy elements, which flip the spin of the electron or the hole so that the spins of the two particles are aligned in the same direction. The iron oxide magnetite (Fe3O4) is in fact able to do just this. "In our experiment, adding magnetite nanoparticles to the substrate increased the efficiency of the solar cells by up to 11 per cent," reports Moseguí González. The lifetime of the electron-hole pair is significantly prolonged. "The X-ray investigation shows that if you mix a large number of nanoparticles into the material used to make the solar cell, you change its structure", explains co-author Dr. Stephan Roth, head of DESY's beam line P03 at PETRA III, where the experiments were conducted. "The solar cell we looked at will tolerate magnetite nanoparticle doping levels of up to one per cent by mass without changing their structure." The scientists observed the largest effect when they doped the substrate with 0.6 per cent nanoparticles by weight. 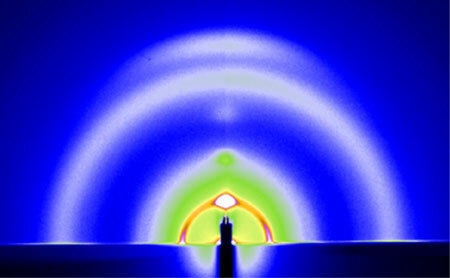 This caused the efficiency of the polymer solar cell examined to increase from 3.05 to 3.37 per cent. "An 11 percent increase in energy yield can be crucial in making a material economically viable for a particular application," emphasises Müller-Buschbaum. The researchers believe it will also be possible to increase the efficiency of other polymer solar cells by doping them with nanoparticles. "The combination of high-performance polymers with nanoparticles holds the promise of further increases in the efficiency of organic solar cells in the future. However, without a detailed examination, such as that using the X-rays emitted by a synchrotron, it would be impossible to gain a fundamental understanding of the underlying processes involved," concludes Müller-Buschbaum.